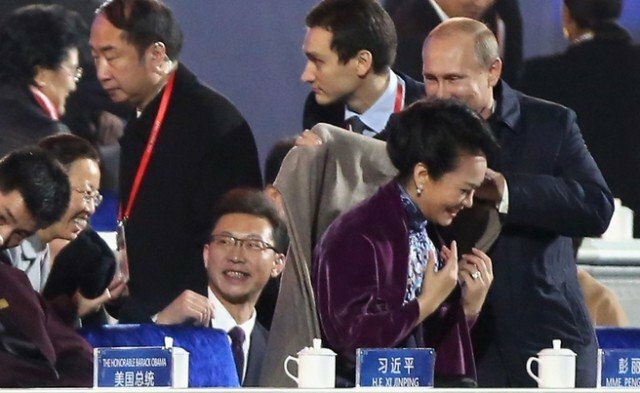 At an APEC event to watch the fireworks in Beijing on Monday night, Russian President Vladimir Putin created a few of his own by slipping a shawl over the shoulders of China’s First Lady Peng Liyuan. A smiling Peng Liyuan, wife of Chinese President Xi Jinping, accepted the offer, but removed the shawl only seconds later, replacing it with her own black jacket. Perhaps after seeing how the forums pounced on the moment, state TV stopped running that scene and there is no mention of it official state media.